Ghost Story /Hawks Aloft Inc. It had been a long night, with one incident crescendoing onto another and it was later than usual when Sarah finally turned off the lights and locked the door. With her pack fully loaded with books, she stepped briskly down the stairs to begin her walk home. Although Sarah was a remarkably confident woman, her steps always quickened as she passed the boarded up, decrepit building adjacent to the cemetery, and tonight was no different. Suddenly, she stopped dead in her tracks as the sound of a large object hitting the floor emanated resoundingly from the old house. A bloodcurdling shriek accompanied the pronounced clank and, as she stood frozen in place, a white form emerged from the broken panes of the upstairs dormer window and flew right over her head. The blood drained from her brain as her heart pounded thunder in her ears, Sarah knew not whether she should cower or flee. A ghost, warning her of impending doom? Or, was there a more practical explanation? The Barn Owl, more than all other owls, is heavily associated with superstition and mythology. The species is sometimes called the Ghost Owl, Death Owl, or the bird of doom due to its nightly hunting habits, the fact that it is white below, and its vocalizations that include the voluminous, unearthly shriek. Living up to its name, it often roosts and nests in abandoned buildings, beneath bridges, and in New Mexico, in cavities in arroyos and canyons. It is heavily referenced in superstition, and in ghost and Halloween stories. Barn Owls also are featured prominently in literature and art, most recently in the Harry Potter stories by J. K. Rowling that portrayed owls as messengers for the witches and wizards of Hogwarts. Barn Owls were thought to be the animal familiars of wizards and witches, and some witches were even said to ride on owls rather than broomsticks. In some societies, Barn Owls were considered harbingers of death and their cry a warning that someone was soon to die. Others believed that the owls cursed people, were responsible for the deaths of babies, and were the Devil’s companions, able to make clairvoyant predictions. Some Native Americans believed that evil people were reincarnated as Barn Owls when they died. But, like all other wildlife, this owl is just doing what comes naturally, surviving. Their secretive nature renders them inconspicuous to most people, so it is not surprising that individuals who do encounter this bird are startled. It is its appearance, combined with some particular behaviors, that make the bird so frightening. 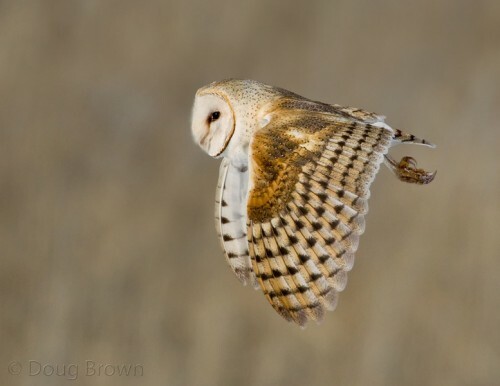 The Barn Owl is the most nocturnal of all birds, and can hunt in almost zero light levels. During daylight hours, it sleeps in a secluded cavity such as an abandoned building, in a cavity or under a bridge. This affords the owl some peace while it dozes throughout the day, for an exposed owl of any species is certain to be relentlessly mobbed by attacking, highly vocal songbirds, including crows and ravens. It emerges from its roost only after the last vestiges of day are gone, winging over open areas to hunt for rodents. 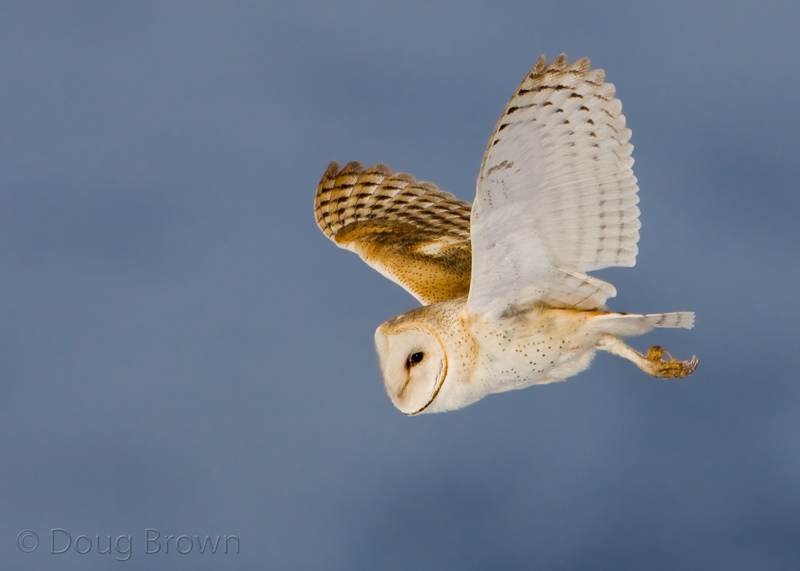 Like all owls, Barn Owls fly silently, coming without warning upon their prey—and sometimes upon humans who also are outside in the dark. Their breast and the underside of their wings are whitish, giving them a luminescent and ghostly appearance against the night sky. And, lastly, their vocalizations include hisses and clicks, and the infamous ghoulish, drawn-out shriek that is abruptly cut off. Declining populations in several areas have raised public awareness of the species. They are a short-lived species with an average life span of less than two years. Birds begin breeding at age one and can produce two broods per year with up to eight young per clutch (in New Mexico). Collisions with vehicles are a major cause of mortality, in the U.S. as well as in other developed parts of the world. 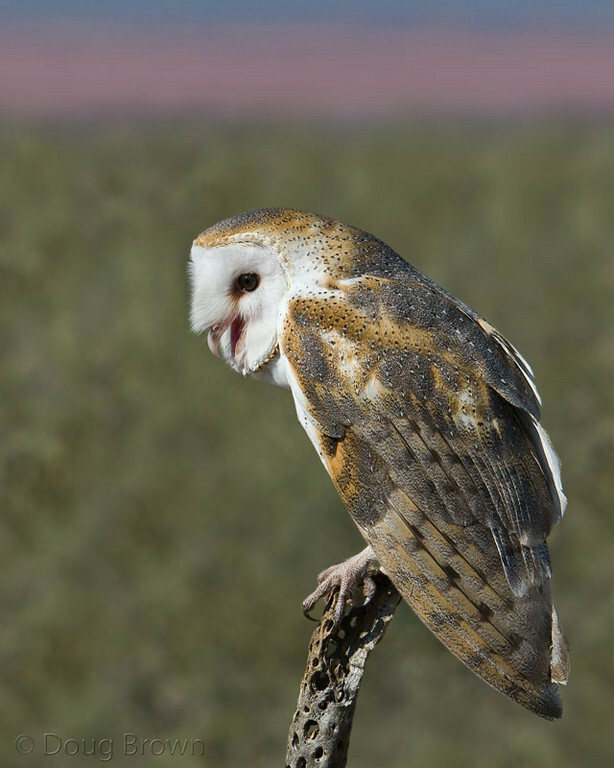 One British study reports that Barn Owl mortality attributed to road kill increased from 6% in 1910-1954 to 50% in 1991-1996; major roads caused the complete extinction of breeding Barn Owls within 1/4-1-3/4 miles of such roads and some depletion from roads up to 5 miles distant. Another cause of mortality, pesticide contamination, particularly from secondary poisoning of anticoagulant rodenticides, occurs when the owls consume poisoned rodents. However, potentially more damaging is the loss of foraging areas and/or prey populations due to urban sprawl and changing agricultural practices. A few years ago, I investigated an old abandoned shed in the Estancia Valley. Upon approach, I knew that owls lived there. Ample evidence in the form of blackish clods of dried pellets littered the ground beneath the overhanging eaves of the building. Once inside, it would have been easy to imagine a ghostly presence for whitewash, another word for owl excrement, coated the walls and dripped from the rusted bedsprings in what would have been the attic. To my dismay, no owls were home that day, and I could only imagine the ghost story I would have told if it had turned out differently.